I'm always preaching the golden rules of Kijiji: deal locally, in cash, in person. That's the holy trinity of Kijiji dealing. Do it face-to-face with someone local, and deal in cash. In this case, I think you would. The Star Phoenix of Saskatoon, Saskatchewan reports on an alleged meth user who was going around town buying iPhones with counterfeit bills. Bad ones. Dude and his girlfriend responded to a couple of Kijiji Saskatoon ads, went to the sellers' homes and paid hundreds of bucks right on the spot before leaving in a hurry. The sellers were following the rules -- local, in person, cash. But one of the victims was swift enough to get a good description of the buyer's car. Cops tracked it down to a home where dude and the missus were staying. 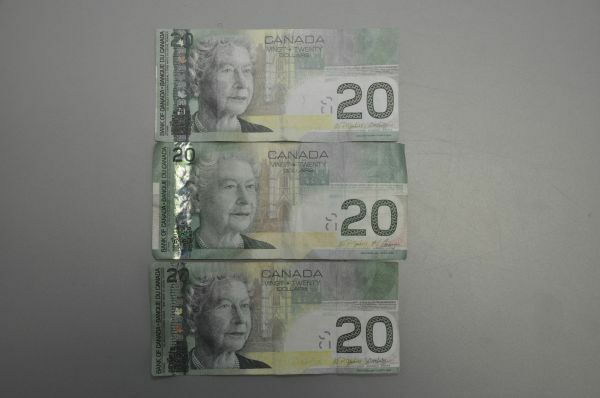 The Crown told court that's where police found a number of “very poor quality” counterfeit $50 and $20 bills in the garage, along with a printer and other counterfeiting tools, such as images of Canadian currency. Dustin Armin Rayat, 24, has pleaded guilty to two counts of using counterfeit money and one count of drug possession related to the meth found in his crappy print shop. His girlfriend, Cheryl Lynn Ellenberger, is before the courts on similar counterfeiting charges. I'm not certain on Rayat's age -- the StarPhoenix says 24, but a report from Leduc RCMP lists an arrest of a Dustin Armin Rayat, age 30, also of Saskatoon, in an unrelated matter. No word what's become of the victims' phones. YouSuckatKijiji sends best wishes to Rayat and Ellenberger on a successful rehabilitation. It's a sad story, as Rayat has reportedly been hooked on meth since he was just a stupid teenager. I hate to see people with screwed-up lives. Good luck to everyone involved.